Giuseppe Farinaccio first appears at Painesville, Lake County, Ohio, between 1930 and 1935. Giuseppe moved his family (wife and three children) from South Euclid, Ohio to Painesville. In America, Giuseppe Farinaccio was known Joseph Farinacci. Giuseppe Farinaccio, son of Giacomo Farinaccio and Maria Nicola Farinaccio, was born in 1893, at Gildone, Italy. Giuseppe married Filomena Puzzo, daughter of John Putz and Mary Mangine, on November 20, 1920, at Cuyahoga County, Ohio. Filomena Puzzo was born in Cleveland, Ohio. Giuseppe died on September 30, 1961, at Painesville, Ohio. His body was interred at Evergreen Cemetery at Painesville, Ohio. Giuseppe Farinaccio immigrated to the United States on June 1, 1907, travelling to Cleveland, Cuyahoga County, Ohio. Giuseppe was 15 years old and immigrated to the United States with his parents, sister, Lucia, and brother, Michele. 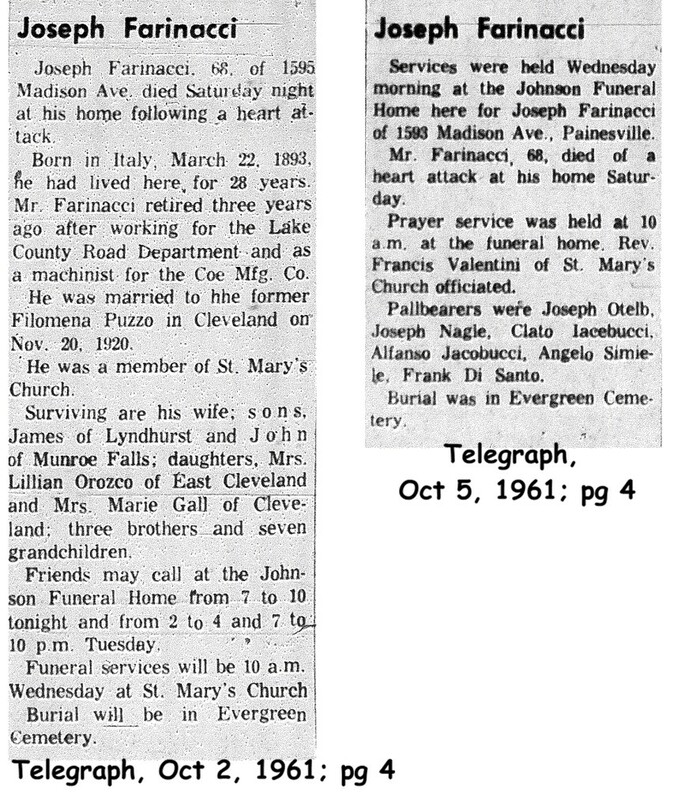 The family was joining Giuseppe’s paternal uncle, Antonio Farinaccio, in Cleveland. Giuseppe Farinaccio was enumerated for the 1930 Census of the United States, in 1930, living at South Euclid, Cuyahoga County, Ohio. He was enumerated for the 1940 Census of the United States, on April 19, 1940, living at Madison Avenue, Painesville Township, Lake County, Ohio. Mr. Farinacci was a retired employee of the Lake County Road Department. 1. Lillian Farinacci was born about 1924 at Ohio. 2. 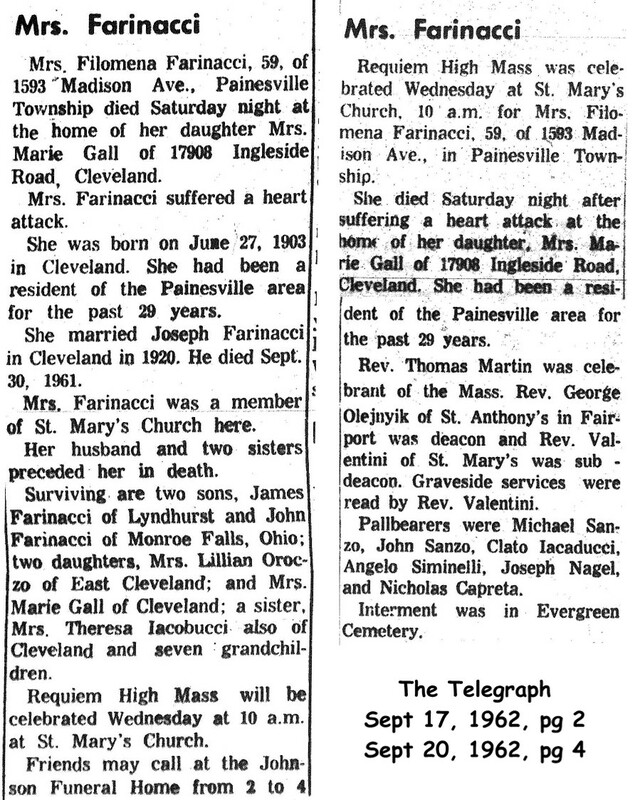 Marie Farinacci was born about 1925 at Ohio. 3. James Farinacci was born about 1928 at Ohio. 4. John Farinacci was born about 1937 at Ohio.